Steve Webb MP was kicked off Facebook for having too many friends for a real politician. Heard the one about the sad individual pretending to be a UK MP on Facebook just so he could be seen to have thousands of friends? Apparently, the gnomes in charge of the networking site have, as they took exception to the fraudster this week and suspended his account without warning. Good for Facebook, we all cry - identity fraud is a serious issue, after all. Only problem is, the fake MP was the Real McCoy trying his damndest to be down with the kids on the information superhighway and to serve his constituents in South Gloucestershire. 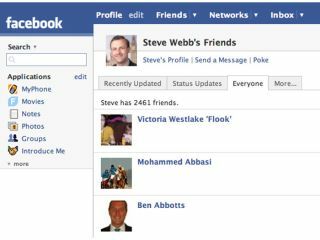 Steve Webb of the Lib Dems has been an MP for over 10 years, but that didn't stop Facebook admin judging him an impostor when they saw his profile with a whopping 2,500 online pals. A swift click of the mouse later and he was online history, something he only discovered when trying to log on. Fortunately, there's a happy ending - as if to prove the power of social networking, Webb's (real, not imaginary) friends rallied round to get him reinstated. Within hours the 'Steve Webb is real' Facebook group had generated enough online noise to get the website to re-evaluate and get the politician back online.